This post is sponsored by my friends at Iowa Pork, but the thoughts and opinions expressed here are all my own – just as always. Are y’all ready for a super easy and super delicious meal that all cooks in one pan? Well, boy do I have something exciting for you! This Sheet Pan Brown Sugar Garlic Pork Loin Filet (whew, that’s a mouthful!) is the perfect blend of sweet and savory and is so easy to prep that it makes it perfect for a busy weeknight meal! 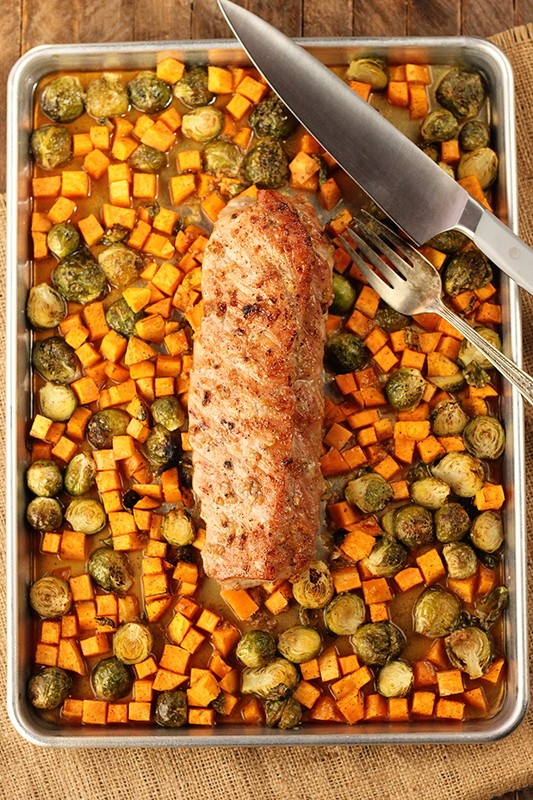 The pork loin filet is rubbed with a brown sugar and garlic rub and is roasted with Brussels sprouts and sweet potatoes making simple dinner perfection! My family just devoured this! The brown sugar rub with the fresh garlic gives the pork the most amazing crust and the sweetness cooks down to add tons of flavor to the veggies. The high heat and quick cooking time means super juicy pork, too! And while it’s great for a quick and easy meal, the flavors are so on point that it would also be perfect for company! And who doesn’t love everything cooking on one pan??? I’m ALL for less dishes to wash.
A few years back, I had the amazing opportunity to visit a pig farm and while I learned so much about the care that goes into the farming part, one of the things that was super helpful was learning about the correct way to cook pork. The USDA now recommends that pork be cooked to an internal temperature of 145°F. This ensures that the pork is cooked through, but still is tender and juicy. It’s perfectly acceptable for there to even be a little pink. 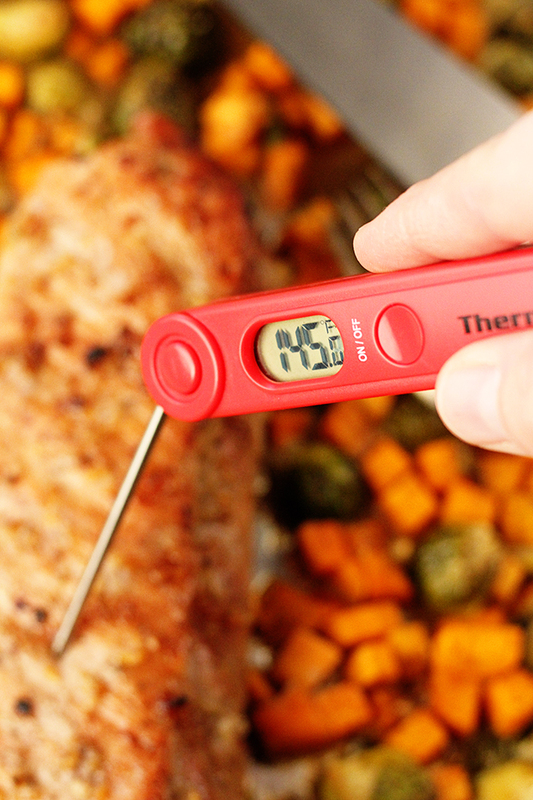 If you’re tired of dry, overcooked pork you need to get you an instant read thermometer. They can be relatively inexpensive, and are certainly one of the things that I think every kitchen needs to have. It the most reliable way to ensure it’s cooked properly. Got more questions about pig farming? Be sure to visit the folks over at Pig Hill Farm on their Facebook page to learn more about their Iowan fourth generation family farm. It’s super awesome to be able to get answers directly from the farmer and allows us the opportunity to wade through the massive amount of misinformation out there. Interesting side note: Did you know that about one-third of the pork raised in the United States comes from Iowa? Be sure what you’re buying is a pork loin filet. Pork tenderloin, pork loin, and pork loin filet are NOT the same thing and each require different cooking times based on the size. 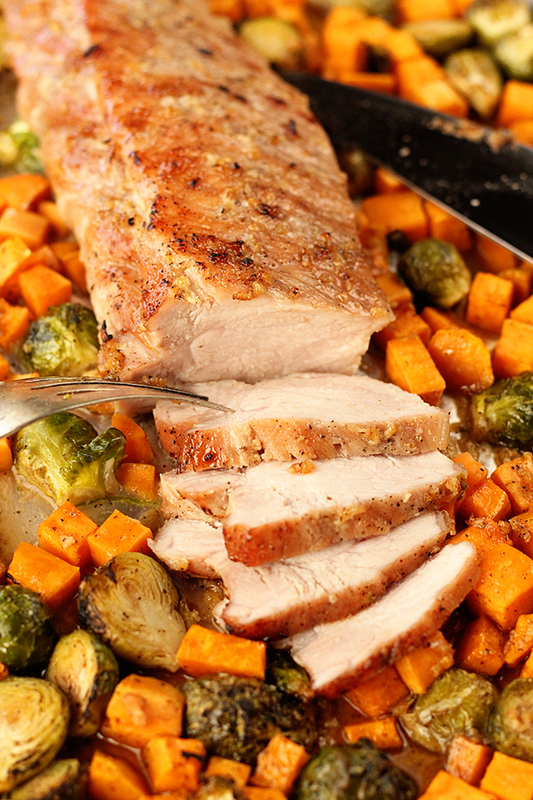 This recipe was developed using a pork loin filet, so using another cut of pork will change the cook time and may also result in undercooked or overcooked vegetables. That said, you CAN use a pork tenderloin if you wish. Finding one that is close to 2 pounds is the best way to make the recipe work without having to make changes to the temperature or cook time. Regardless, if you do use a pork tenderloin instead of the pork loin filet, I recommend that you start checking the meat at about the 25 minute mark and only cook it to 145°F. If the vegetables are still not cooked all the way through at that point, remove the meat to a platter and tent with foil. Then return the vegetables to the oven to finish cooking. 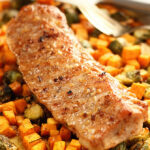 It is vital to the outcome of this recipe that the Brussels sprouts be halved if they are over 1-inch in size and that the sweet potatoes be cut into 1/2-inch cubes. Otherwise, things will not cook evenly. The suggested internal cooking temperature for fresh cuts of pork is 145°F. The best way to test this is with a digital instant read thermometer. They aren’t too expensive and are the most reliable way to guarantee meat that’s safe to eat, but still juicy and tender. If your pork loin filet lacks the browning you’d like after the cook time, about 5 minutes under the broiler will add a little color and flavor – just be cautious not to overcook the meat. 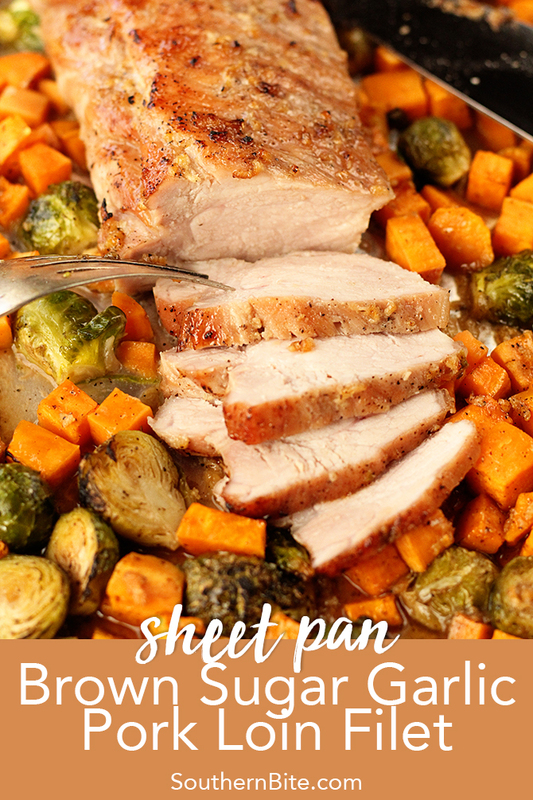 And while this sheet pan meal is an amazingly easy way to get a home cooked meal on the table, the Instant Pot is another. 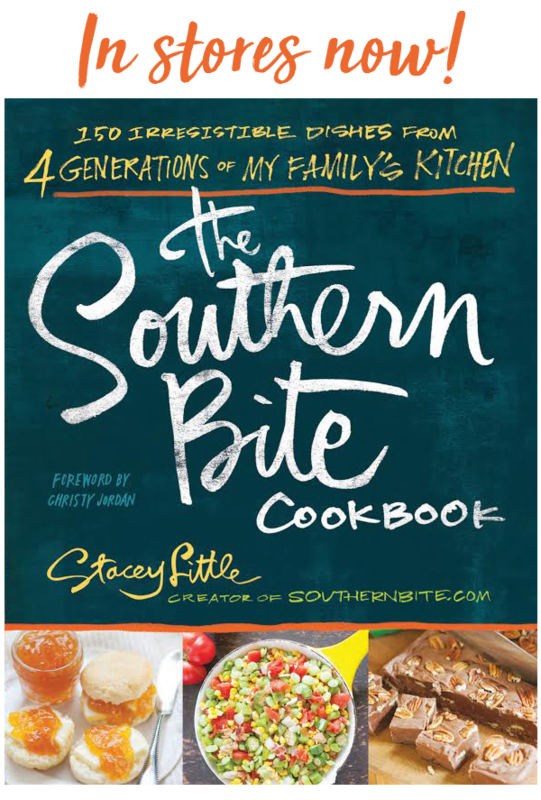 And my friends at Iowa Pork are going to give one lucky Southern Bite reader their very own 6-quart Instant Pot. Entering is easy. Visit my Instagram page for all the details. In a small bowl, mix together the brown sugar, 2 teaspoons kosher salt, 1/4 teaspoon, and the minced garlic. Stir well to combine. Trim any excess fat from the loin filet and rub the entire filet with the brown sugar garlic rub. Set aside. Preheat the oven to 425°F. Wash and trim the stems of the Brussels sprouts. If they are larger than 1 inch, slice them in half. Peel and cube the sweet potatoes into 1/2-inch cubes. In a large bowl, combine the Brussels sprouts, sweet potatoes, vegetable oil, 1 1/2 teaspoons salt, and 1/4 teaspoon pepper. Stir well to coat. Lightly spray a rimmed baking sheet with nonstick cooking spray. Evenly scatter the vegetables over the sheet. Place the loin filet in the middle of the pan. Roast for 35 to 40 minutes or until the internal temperature of the largest end of the filet reads 145° on and instant read thermometer. Allow the meat to rest for about 3 minutes before slicing and serving. This sounds good except we both don’t like brussels sprouts and I only like baked sweet potatoes with cinnamon-brown sugar butter. (And yes, we have tried them as adults, so it’s not our long ago child-selves saying yuck. ) Do you think it would work with carrots and parsnips? Or carrots and white potatoes? I think it would work, the only adjustment would need to be made in terms of cook time to ensure the other vegetables are cooked appropriately. I would cook them until the pork was cooked through and if the vegetables need more time, remove the pork and tent it with aluminum foil and return the veggies to the oven to finish cooking. You just don’t want overcooked pork. This sounds wonderful. Can you tell me what a pork loin filet is? I’m not familiar with it. Thanks. Still waiting for a response to my December 11th question? Hi Teresa! You know the scary thing about comments, emails, and texts? You can’t read tone in them. And honestly, when I first read this, I read it in a super condescending tone – as if you were telling me that I had not provided you with something I was required to. Now, I make it a point to reply to EVERY SINGLE comment on my blog myself. It’s just the way that I want to run my business. And when you run a site that gets more than a million page views each month, that’s a lot of comments. Back to the comment… I’m sure you didn’t mean it in the tone in which I read it. The truth is, ever since you posted your initial comment, I’ve been reaching out the National Pork Board and the National Pork Check-off program to get you the correct answer rather than just my opinion. Unfortunately, I’ve not heard back from them. My understanding is that the pork loin filet is a part of the whole pork loin that is different from the tenderloin. It’s a whiter meat that is often more affordable. For now, that’s the only answer I have for you. Have you been to the grocery store to check out what’s available near you? I’ve been to 5 or 6 in the last few days and have found pork loin filet and pork tenderloin to be the most common thing found in that category. Hopefully, I’ll hear back from the others soon and can provide you with a more educated response. Wow. I’m so sorry you read a condescending tone into my question. That was not my intention at all. I truly am not familiar with a pork loin filet but will ask my butcher the next chance I get. I won’t bother you again. You’re not a bother. I just don’t have an answer for you as of yet. Hoping to hear something more concrete after the holidays. 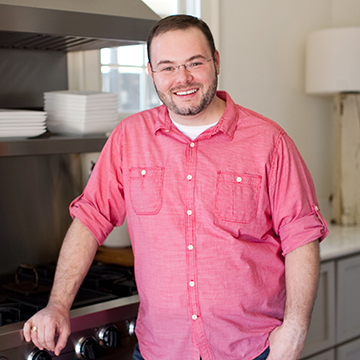 I keep checking your web page for new recipe inspiration and have been missing your posts lately. Hope you and your family are enjoying some well-deserved time off and that you will be back to blogging soon. Happy Holidays! What do you think about butternut squash instead of the sweet potatoes? I really like squash better. I have a pork roast that I deboned and am going to try your recipe. I know it isn’t the pork loin filet but I like to take risks. LOL. 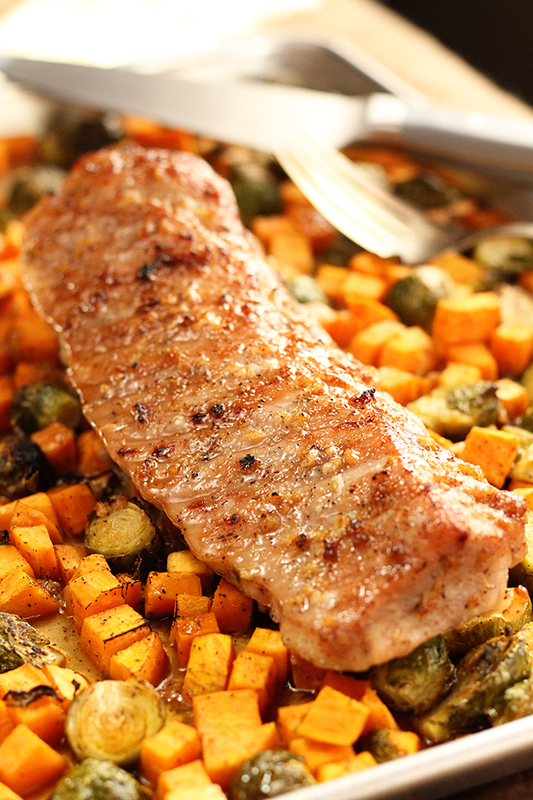 Skip the Brussel sprouts and add pineapple with the sweet potato. It is making me hungry already! Thanks for the inspiration. Sounds great! Hope you’ll enjoy!! I am wondering about the juices in the pan that show in the pictures, yet you don’t say to add any water, etc. Is that juice all released from the pork/veggies? Thanks!